Since the release of Autodesk® Factory Design Suite, customers and end users alike have had some basic questions about the suite. In March, I will be hosting a live webcast and a hands-on test drive so I wanted to overview who the suite helps and why, and of course how it addresses concerns for the entire organization. For this discussion, I am going to focus on two groups. 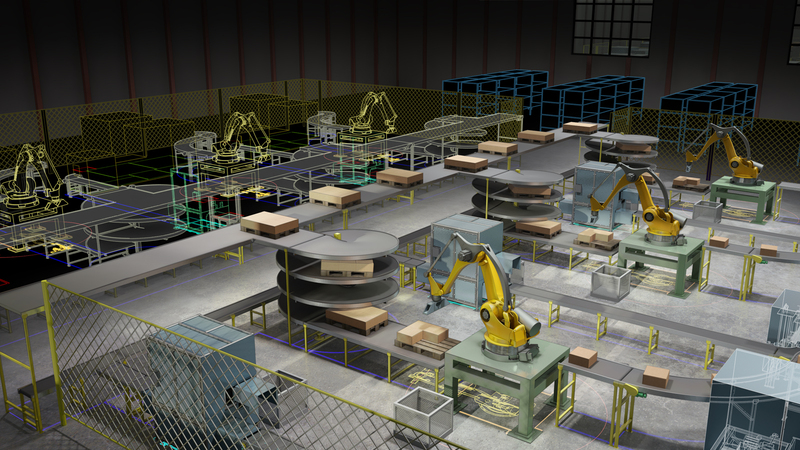 Autodesk® Factory Design Suite is an interoperable 2D and 3D factory layout and optimization solution built specifically to help you design and communicate the most efficient layout by creating a digital model of your factory. It enhances AutoCAD® and Autodesk® Inventor® software with exclusive access to interoperable layout workflows and factory-specific content to help improve your design efficiency, accuracy, and communication. See the full Autodesk Factory Design Suite Brochure. That’s a great Autodesk overview, but let’s look at specific factory concerns from two business perspectives – factory owners and then equipment builders/systems integrators. Challenge #1: Cleary communicating your layout ideas with internal and external stakeholders. The Factory Design Suite offers a 3D environment that allows you to drop and drag your components to enable stakeholders to see all the possibilities in a matter of minutes. With the additional visualization tools, you will bring your factory to life through interactive 3D walkthroughs, so you can make confident & accurate decisions earlier in the design process. Challenge #2: Effectively detect clashes, and identify space constraints, in the 2D layout. A complete set of 3D tools makes identify clashes & space constraints before the real equipment is commissioned on the factory floor. Using a single Factory model, you can detect interferences and even simulate the installation of equipment, to save time on errors during equipment installation. Challenge #3: Spending too much time manually creating & updating plan views and section drawings of the layout. Automatically generate plan views & section views of the layout which are always associative and do not need manual updates. Autodesk Factory Design Suite allows you to automatically create 2D plan views and section drawings from your 3D models, these drawings are always associative, so if the 3D model changes the 2D documentation is always up to date. Challenge #4: Spending too much time manually doing tape measurements to capture the as-built state of the facility. Virtually eliminate the time involved in doing manual tape measurements to capture the as-built state of the factory. Autodesk Factory Design Suite provides support for laser scanning workflows which allows you to design your layout directly in context of the as-built state of the facility. Challenge #5: Difficulty in designing and viewing large factory layouts in 2D/3D. Use Factory Design Suite to aggregate 3D data from different CAD systems to bring together design, manufacturing and plant & supplier data into a single digital model, allowing all stakeholders to use the 3D model to validate the design, eliminating the need to maintain or have access to different CAD systems. Factory Suite is compatible with all major native design & laser scan file formats so data from various sources can be combined together to create a single digital model for review, regardless of size. This particular group has some common business challenges. Let’s take a look and see how we can address them. Challenge #1: Getting a competitive edge in winning bids. Improve your win/bid ratio by being able to share layout proposals of your machines & equipment with your clients in 3D. Autodesk Factory Design Suite provides an easy to use, visual layout environment where you can drag and drop 3D factory models from a library on a floor plane allowing you to create compelling 3D layouts in a matter of minutes, significantly faster than 2D workflows. Challenge #2: Differentiating from the competition with compelling sales tools. Develop compelling interactive sales and marketing collateral that give you a competitive advantage in winning bids. Autodesk Factory Design Suite allows you to create compelling 3D visual layouts and fly throughs and walkthroughs of your machine layouts and share it with your clients. This enables you to clearly communicate your layout ideas in 3D and helps you to differentiate over someone who is communicating layout ideas in 2D. Challenge #3: Spending too much time & effort in the pre-sales phase of creating bidding layouts. Easily create pre-sales bidding layout proposals and react quickly to changing customer requirements. Autodesk Factory Design Suite provides a easy to use visual layout environment, where you can drag & drop 3D models of factory equipment on top of a floor and easily move them around to evaluate multiple what-if scenarios in a fraction of the time compared to traditional 2D workflows. The 3D Visual Layout enables you to automatically generate 2D plan views and section views for documentation which are always associative to the 3D layout. Challenge #4: Running over budget & over schedule affects the bottom line revenue. Improve the efficiency of your layout processes to boost your bottom line revenue. Autodesk Factory Design Suite delivers a compelling solution for 2D/3D layout of machines & factory equipment; it is purpose built layout solution to help users be more productive. It includes AutoCAD, thereby protecting your existing investment in DWG data and extends the workflow to enable users to easily create compelling 3D visual layouts. Do you have other concerns I did not address? Please comment below or let me know and I will make sure to address it in the webcast on March 14th. I will be live at 3 pm to show you the workflow in action. Questions are requested! See more below. Interested in a hands-on experience? We are also hosting an Autodesk Factory Workflow Test Drive on March 28th at a location of your choice of our training locations (see registration page for more details). Sign up now to attend for free. Hope to ‘see’ you on the webcast and at the test drives. See Bob’s article on Leveraging Factory Assets. Thanks for this very informative article. The http://rushengineering.com.au/ is also implementing these to promote health and safety of their workers. Will be looking forward to reading your articles.